The Bennelong Letter Photo: Kylie Martin. 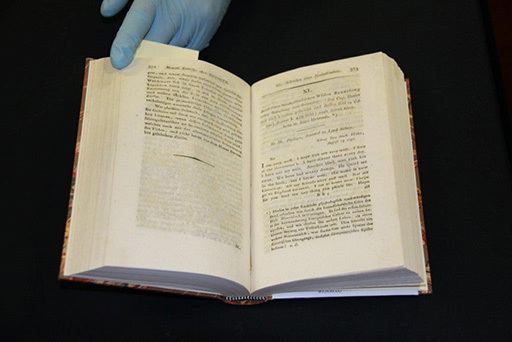 The AIATSIS Collection holds a very precious copy of what is considered to be the first known use of written English by an Aboriginal Australian. It is a copy of what is known as the ‘Bennelong Letter’ and represents a seminal work in Australian Aboriginal literature and an authentic Aboriginal voice. It is also the first time that an Aboriginal author has appeared in print. The letter is contained in the 1801 German publication: “Monatliche Correspondenz zur Beforderung der Erd and Himmelskunde” (“Monthly Correspondence for the Promotion of Geography and Astronomy” edited by Franz Xaver Freiherr von Zach. Von Zach was a Hungarian astronomer who accepted the letter for publication from the German anatomist Johan Friedrich Blumenbach having received it from Joseph Banks who in turn acquired a copy from Governor John Hunter. The original letter was dictated by Bennelong on August 29 1796 from Sydney and is addressed to “Mr. Phillips, Steward to Lord Sidney [sic]”. Historians have not been able to find a steward to Lord Sidney named Mr Phillips and this has led to speculation that the letter may in fact have been aimed at former Governor Phillips as his second wife nursed Bennelong when he was ill in England and this is referenced in the letter. Woollarawarre Bennelong was a Wangal man from the south shore of the Parramatta River, who is believed to have been born about 1764. He formed a friendship with Governor Arthur Phillip who took him and his kinsman Yemmerrawanne to England in 1792. He spent three years in England where he took reading and writing lessons and would have been exposed to various other elements of English cultural life. John Hunter points to Bennelong’s fascination with writing when at Governor Phillip’s one night “Bannelong went into the house as usual, and finding the governor writing, sat down by him” (Hunter, Chp XIX). Whilst the letter is written in English, the Aboriginal voice of Bennelong comes through in expressions such as “his name was Carroway”. As Smith points out ‘’carraway” or “caruey” (white cockatoo) was a young uninitiated Cadigal man who appropriated Bennelong’s wife Kurubarabula (Smith, 2012, pg 3). The word “muzzy” is thought to represent a transcription error of the word “murri” which means “big” in the Sydney language. The request for stockings, a handkerchief and shoes may seem inappropriate in this context, but from an Aboriginal etiquette point of view it reflects the practice of reciprocity and gift exchange that he would have expected from his English hosts. Smith has successfully argued that Bennelong was a master politician, brokering alliances among various factions via marriages for himself and his sisters in order to secure, and later extend, his leadership within his Wangal clan (2009). This account challenges the oft told story that Bennelong was shunned by Europeans and his own people alike on his return from England. Bennelong died in 1813 and is buried in the orchard of brewer James Squire in the present day suburb of Putney in Sydney. The original of the letter has never been found. You can listen to the story of the AIATSIS Bennelong Letter.